Coxeter, H. S. M. (May 13, 1954). "Uniform Polyhedra". Philosophical Transactions of the Royal Society of London. Series A, Mathematical and Physical Sciences. 246, (916): 401–450. เอริก ดับเบิลยู. ไวส์สไตน์, "Rhombicuboctahedron" จากแมทเวิลด์. 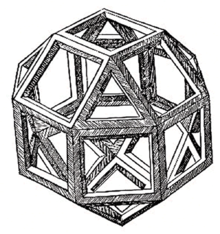 Archimedes and the Rhombicuboctahedron by Antonio Gutierrez from Geometry Step by Step from the Land of the Incas. หน้านี้แก้ไขล่าสุดเมื่อวันที่ 9 มีนาคม 2556 เวลา 22:04 น.